Memorial at All Saints Church, Wokingham. 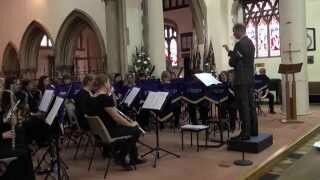 Band Concert in September 2014. National Emblem, written by Edwin Eugene Bagley, was composed in 1902 and published in 1906. Bagley composed the score during a 1902 train tour with his family band. He became frustrated with the ending and tossed the composition in the bin. Members of his band fortunately retrieved it and secretly rehearsed it in the baggage car. Bagley was surprised when the band informed him minutes before their next concert that they would perform it! It became the most famous of all Bagley’s marches. 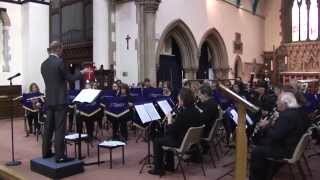 This performance by Trinity Concert Band was recorded at All Saints Church, Wokingham on 14th September 2014 as part of the Heritage Day Concert. Paul Speed was conducting the band. 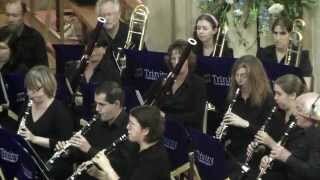 English Folk Song Suite is an original composition for military band, later arranged by Gordon Jacob for orchestra. Ralph Vaughan Williams, one of England’s greatest composers, worked with many famous musicians around the turn of the century – Parry, Stokowski, Bruck, Ravel and Holst – as he developed his talents. His composing skills developed slowly; it was not until he was 30 that the song “Linden Lea” became his first publication. In 1904 he sought out English folk songs and carols, fast becoming extinct, transcribing many of them himself. Many of his compositions, even his symphonies, contain references to folk melodies. Vaughan Williams was 41 when the war started, and enlisted in the Royal Army Medical Corps, and was commissioned in the Royal Garrison Artillery in 1917. Chanson Triste is the second of twelve short piano compositions by Tchaikovsky written primarily for amateur musiciians. Deceptively simple, this piece has a disarming sincerity. In the concert held in Wokingham’s Drill Hall on October 17th 1914, it was played by Miss Olive Crowe. 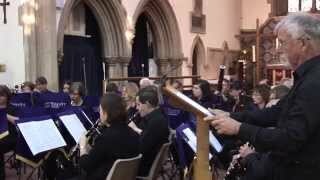 The concert was one of many held to raise money for the Patriotic Fund that had been started in 1899 to assist widows and orphans of Wokingham soldiers and sailors killed in the Boer War. The music has been transcribed for many instruments; this is an arrangement by Alfred Reed, the doyen of concert band composers. Keep the Faith started as a personal tribute to the composer’s late mother. Not long after starting to write, Duncan Stubbs was approached to write music to accompany a rendition of the poem “We Will Keep the Faith” by Moina Michael as part of the World War 1 remembrances. Stubbs felt the appropriateness of the music already written, and the sentiment behind both concepts, was a coincidence too good to overlook. Duncan Stubbs is the Principal Director of Music of the Royal Air Force, whose Central Band first played this piece under the composer’s direction. The Heritage concert was concluded with the ceremony of Sunset, which marks the end of day and the lowering of the colours of British regiments. With the plangent bugle call over the hymn tune, it is a reminder that though a day comes to an end, the sun will return tomorrow, hopefully for a better day. 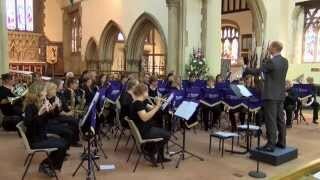 This performance by Trinity Concert Band was recorded at All Saints Church, Wokingham on 14th September 2014 as part of the Wokingham Heritage Day Concert. Paul Speed was conducting the band. 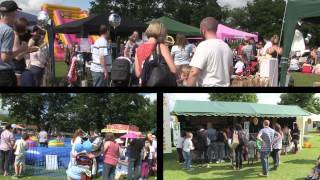 This was filmed by David Gregory and shows highlights of the Woodley Carnival events during 2014.